I love making cakes. I have been doing so since I was 5 years old. 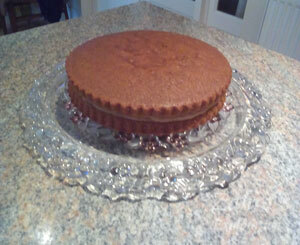 My favourite cake in the world is a bog-standard sponge. 4 ingredients: caster sugar, margarine (butter), eggs and self-raising flour. Mix them together (one by one), bung it in the oven. Subhan'Allah! There is NOTHING more gorgeous than a freshly baked cake. I really dislike decorating my cakes. Decorating usually involves icing, butter icing, royal icing, ganache, marzipan, cream etc, etc. Elaborately decorated cakes always look very impressive but I always think, "Do they really taste that good?" I know it takes a lot of hard work and effort to decorate a cake, but the icing and decoration must taste really sweet. Once I got given a slice of cake and there was more icing on my plate than sponge! (And it tasted a bit gross.) So my cakes are usually plain. 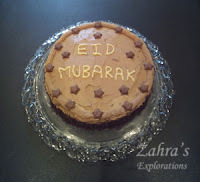 On the Saturday after Eid, we were having a lunch daavat (invitation) and I was going to make a cake. I decided to make a chocolate layered cake as there were going to be some children. I did read about some chocolate fudge sponges (which sounded really decadent) but chose a plain sponge (basic four ingredients with cocoa powder) as there was going to be icing and I didn’t want the cake to be overly heavy. The sponges turned out really nice Alhamdulillah. I didn’t have two 23cm cake tine. So used my 23cm pie dish. Cooking took a bit longer as I had to bake them one at a time, washing the tin in between etc. But they had a very pretty crimped edge. 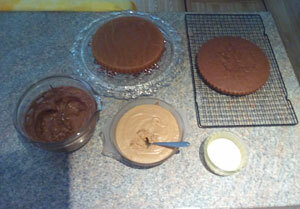 The top and sides were covered with chocolate butter icing. I used milk melted chocolate in the mixture instead of cocoa powder. It was nice. But obviously sweet. For some reason, I decided I wanted to cover the sides with chocolate vermicelli (which is why I had to put butter icing on the sides of the cake) it was really hard to apply. I started with my mum holding the cake stand and me sprinkling the strands on top. Then I had to keep brushing away the excess strands (of which there were a lot). 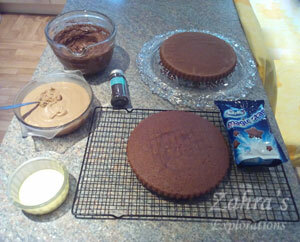 I found the easiest way was to pick up some strands on my pastry brush and then apply them to the side of the cake. But it was very time-consuming. 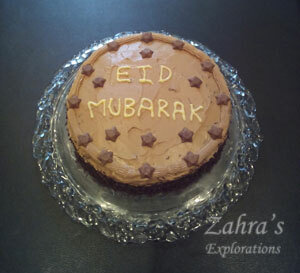 On the top I wrote “Eid Mubarak” in plain butter icing which I had set aside and decorated it with chocolate stars. 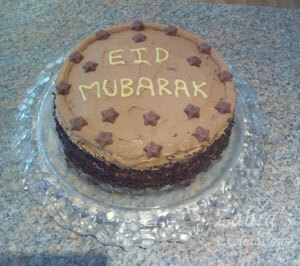 Masha'Allah, my cake looked really nice. I really liked it. A very apt cake to celebrate Eid. But it was a lot of hard work. Unsurprisingly, I felt that it was just a bit too sweet. I don't think it was necessary to cover the sides. One, they looked quite pretty due to the baking tin I had used. Then there was an additional application of butter cream and the chocolate strands were just way too much hard work to apply and fairly messy, in both applying and eating. Although, they did make the cake look nicer rather than just leaving the sides plain with butter cream. I think a layer of butter cream only on the top would have been fine. Also I would probably stick to milk chocolate for the ganache. I found it too bitter with the dark chocolate and I think the children did too. I tasted it after whisking it, and it was really strong. My brother liked it though! I actually gave him the leftover ganache as no one in my house was going to eat it!